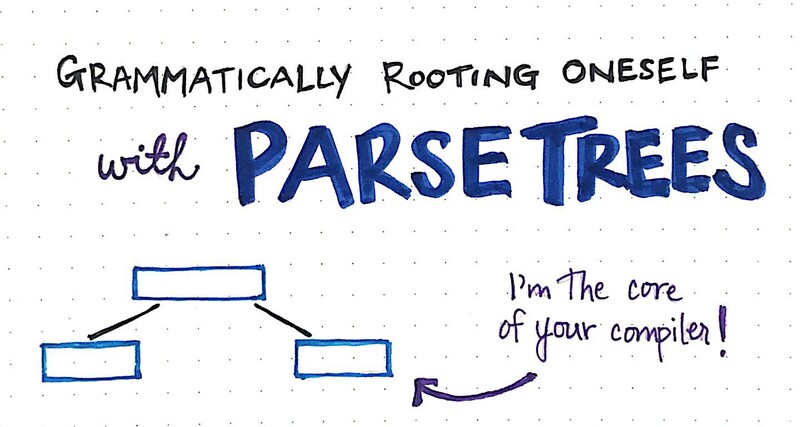 Abstractions are powerful things when you can see beyond them, and being able to understand how something is abstracted away and why can make you a better programmer. However, by the same token, every abstraction was created for a reason: so that none of us would have to worry about them on a day-to-day basis! We’re not meant to think about abstractions all the time, and for the most part, very few of us actually do. Here’s the thing though — some abstractions are more equal than others. The ones that most engineers are probably concerned with are the ones that involve how they communicate with their computer, and the ways in which their computer actually understands them. 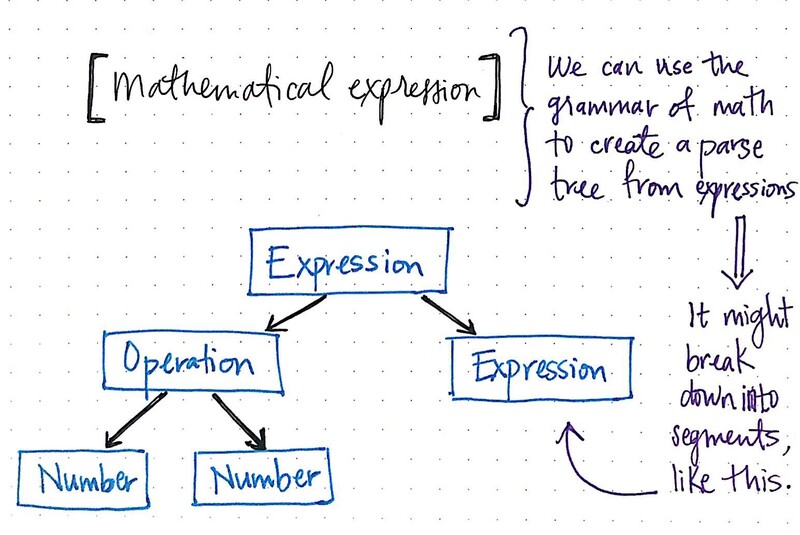 Even if we none of us ever have to write a bubble sort algorithm, if we write code, then we have to communicate with our machines. We can start by breaking up the sentence into two parts: a noun, "Vaidehi", and a verb phrase, "ate the pie". Since a noun cannot be broken down any further, we’ll leave the word "Vaidehi", as it is. Another way to think about it is the fact that, since we can’t break down a noun any further, there will be no child nodes coming from this word. Alright, so all that’s left now is the noun phrase, "the pie". We can split this phrase up into two distinct pieces: a noun, "pie", and its determiner, which is known as any modifying word of a noun. In this case, the determiner is the word "the". 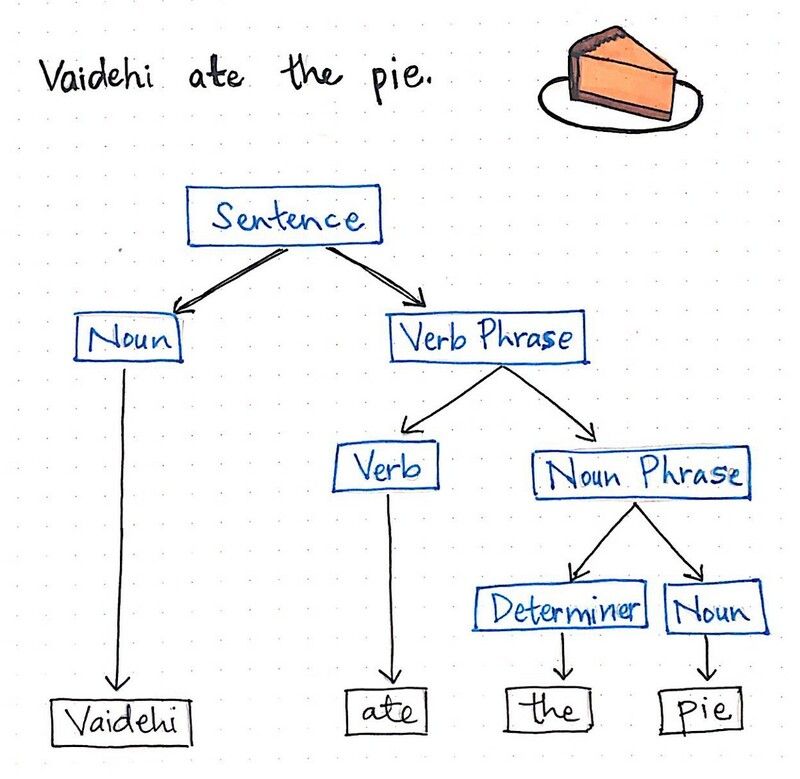 Interestingly, we knew how to diagram the simple sentence, "Vaidehi ate the pie." because we were already familiar with the grammar of the English language. Imagine if our sentence was missing a noun or a verb altogether? What would happen? Well, we’d likely read the sentence the first time around and quickly realize that it wasn’t even a sentence at all! Rather, we’d read it, and almost immediately see that we were dealing with a sentence fragment, or an incomplete piece of a sentence. 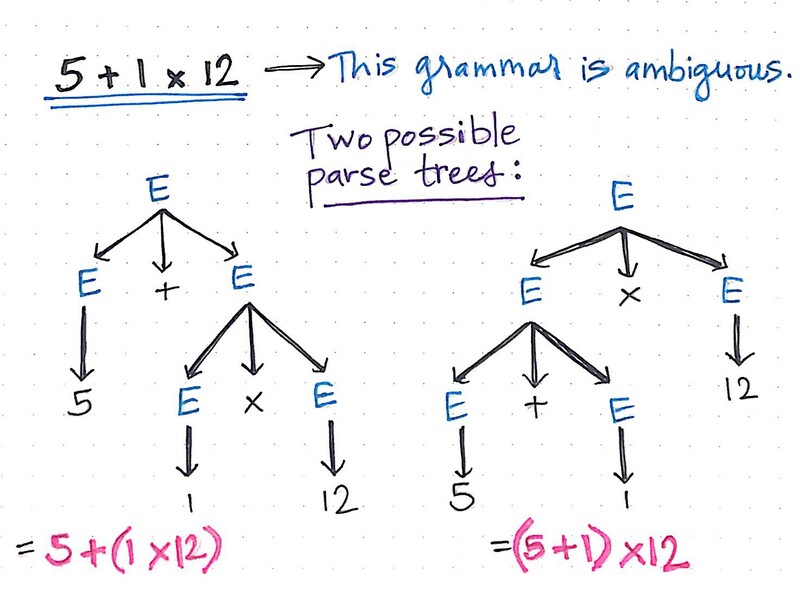 Parse trees show us what our expressions look like, revealing the concrete syntax of our expressions, which often means that a single parse tree could express a “sentence” in various different ways. 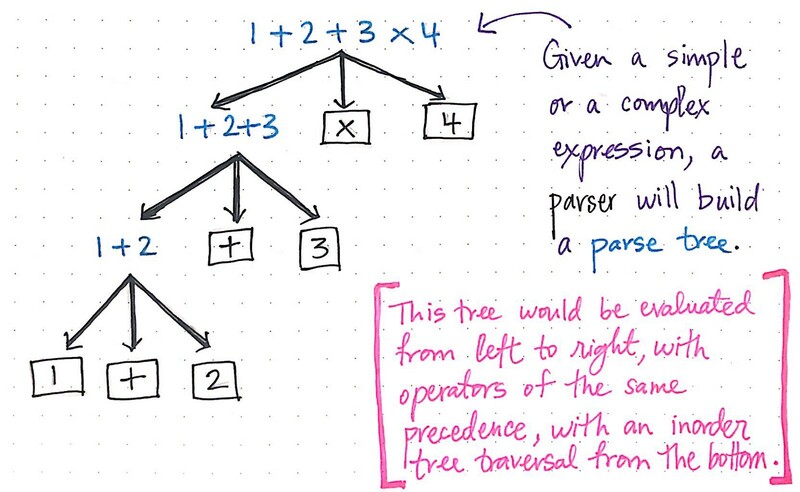 For this reason, parse trees are also often referred to as Concrete Syntax Trees, or CSTs for short. 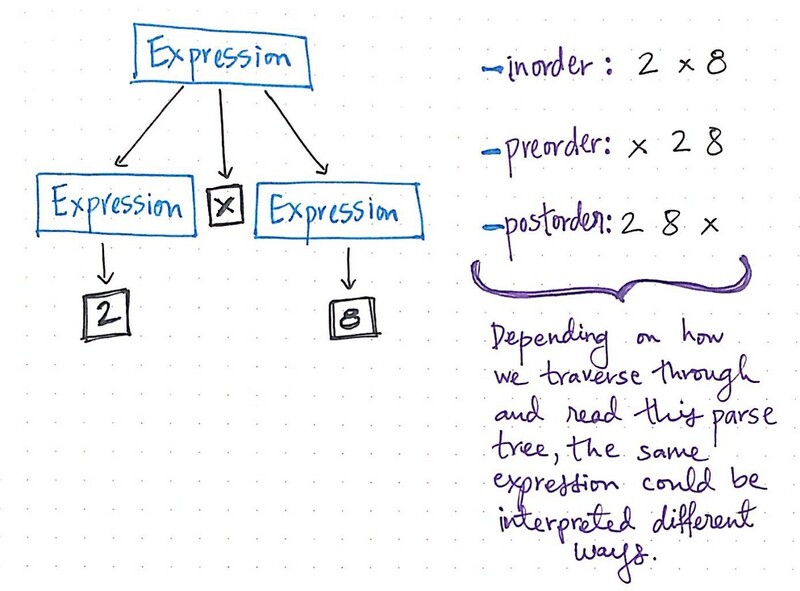 When these trees are interpreted, or “read” by our machines, there need to be strict rules as to how these trees are parsed, so that we end up with the correct expression, with all the terms in the correct order and in the right place! These are what we refer to as terminals, which are also commonly known as tokens. 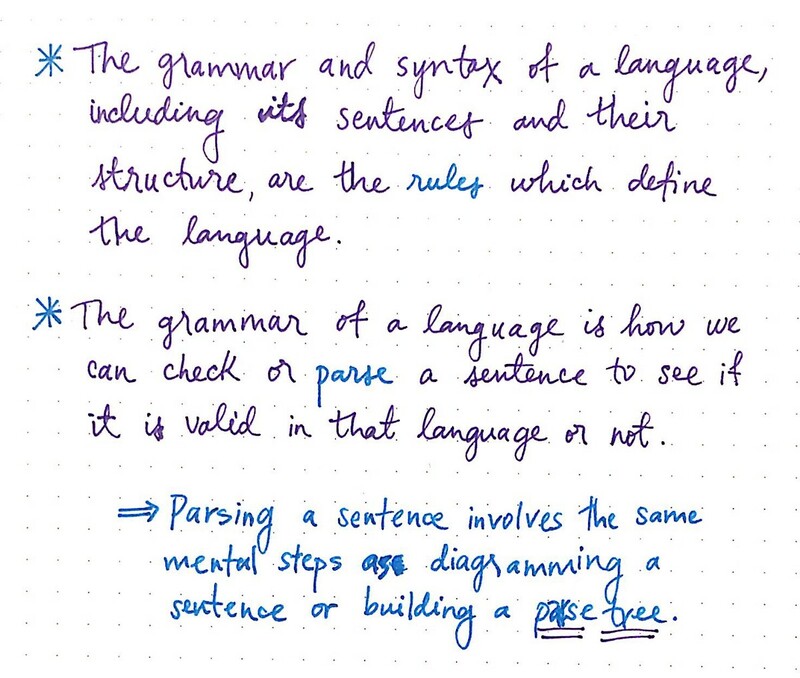 They are crucial to all programming languages, because they help us understand how parts of an expression relate to one another, and the syntactic relationships between individual elements. 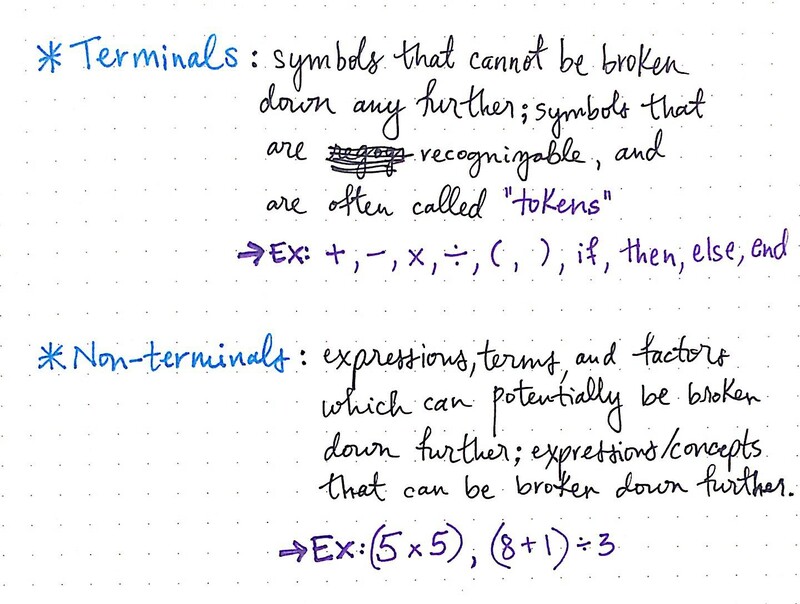 Some common tokens in programming include the operation signs (+, -, x, /), parenthesis (()), and reserved conditional words (if, then, else, end). 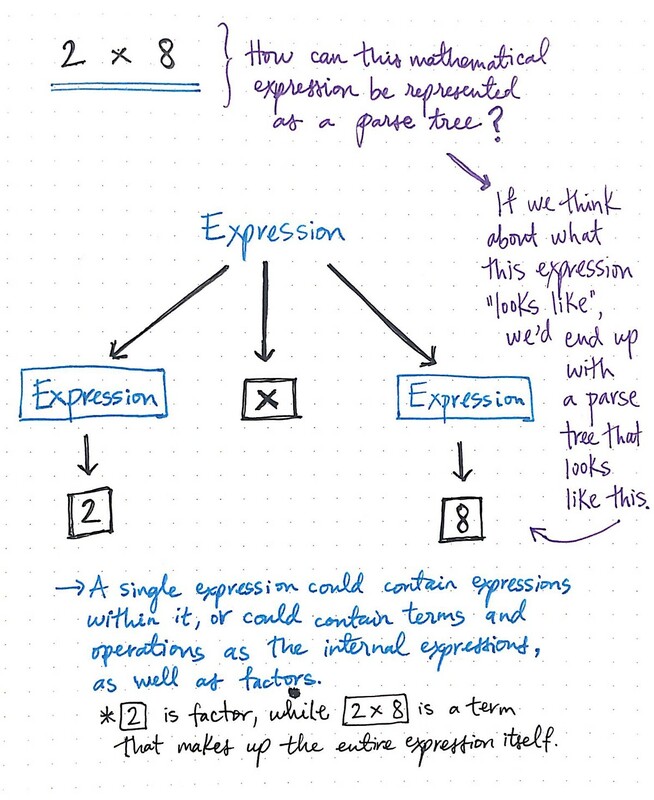 Some tokens are used to help clarify expressions because they can specify how different elements relate to one another. 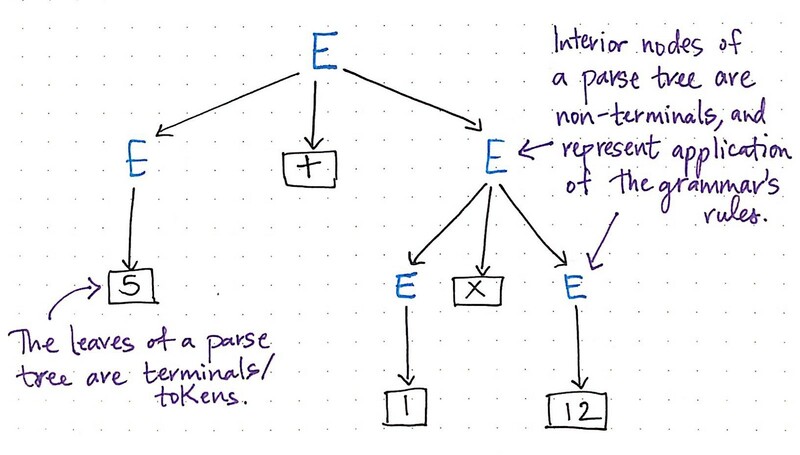 So what are all the other things in our parse tree? We clearly have more than just if's and + signs in our code! 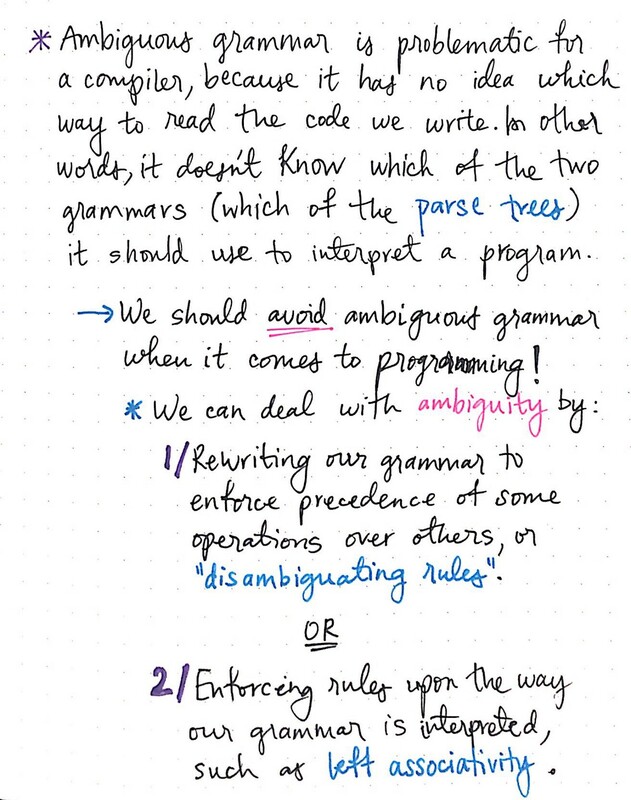 Well, we also usually have to deal with sets of non-terminals, which are expressions, terms, and factors that can potentially be broken down further. These are the phrases/ideas that contain other expressions within them, such as the expression (8 + 1) / 3. 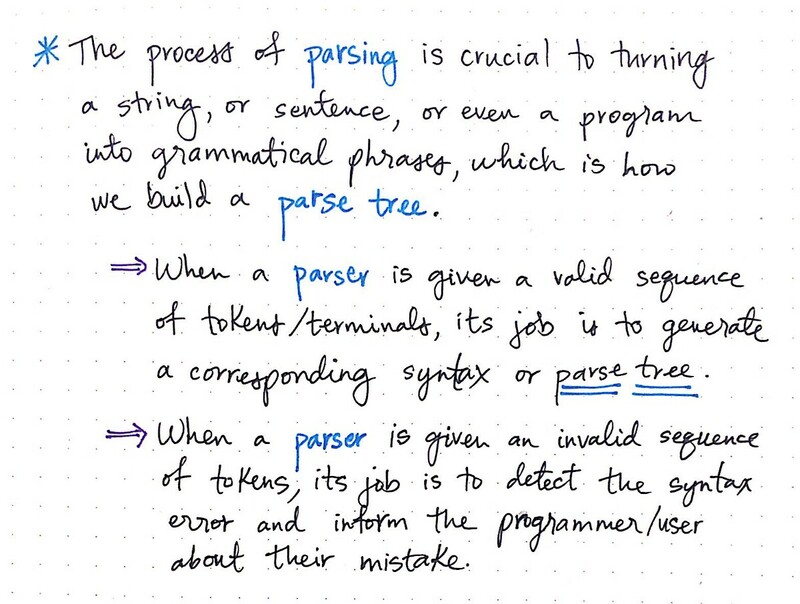 Well, as it turns out, the thing that cares about the parse tree the most is the parser, which is a part of a complier that handles the process of parsing all of the code that we write.